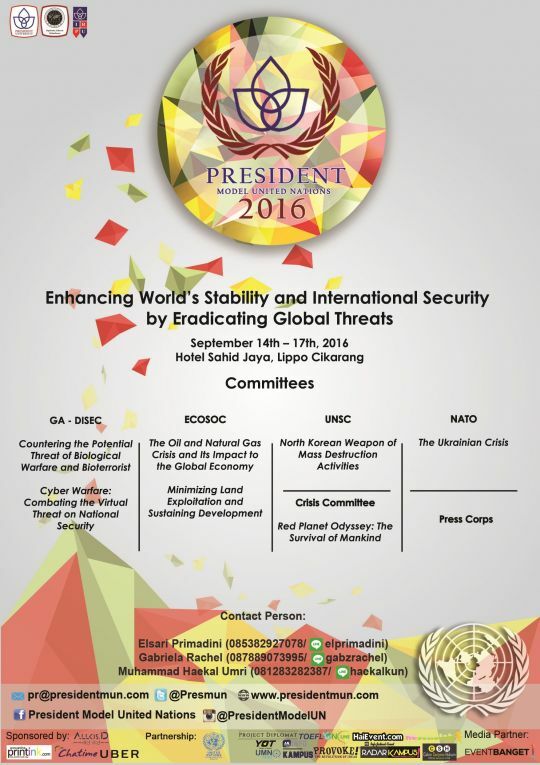 "Enhancing World's Stability and International Security by Eradicating Global Threats"
A new council that will bring a fresh breeze to the flow of President Model United Nations experience. This council will attract new delegates who are interested in journalism, editorial, and article making. Press delegates will move from one chamber to another to listen, compose, interview, and produce an article also reporting what is actually happening in each council’s chamber. They will represent international news media such as BBC, CNN, Al-Jazeera, Sky News, African Daily, and other news media all around the world. They will be responsible for the publishment of daily news letter of council’s progress to President Model United Nations website. Follow our Social Media accounts and keep updated! Setelah iOS, Kini Kotakers Sudah Bisa Memainkan Game Mobile Evel Knievel di Android!